Illustration by Linas Garsys for The Washington Times. The international media have focused on the recent Israeli airstrikes in Syria and what it means to the region. What and whom did Israel target? Was there an imminent threat to Israel? Does the strike portend a widening conflict? There are several reasons for Israel's timing. 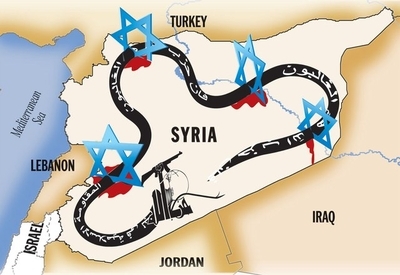 The first is that Israel has been explicit, warning that it would act to prevent the Syrian quagmire from crossing two red lines — the transfer of advanced weapons or chemical weapons to Hezbollah, and the acquisition of those weapons by the al Qaeda-linked terrorist group Jabhat al-Nusra, which is fighting the regime. Another reason is the perception that President Obama has retreated from his own red line, drawn at the use of chemical weapons in Syria. By backing down, the president is inducing Israel to re-emphasize that its own red lines were real — a message designed for the rulers of Tehran as much as it was for Syria and Hezbollah. The shifting strategic balance of power between Israel and Hezbollah on one hand and Syrian President Bashar Assad's relationship with Hezbollah on the other accounts for these airstrikes. Israel's strikes in Syria reflect its growing understanding of the new reality in the Middle East. The new reality can be traced to the spring and summer of 2000, after Israel's unilateral withdrawal from southern Lebanon was followed by the death of Syrian President Hafez Assad. His passing paved the way for his son, Bashar, to take the helm and thereafter alter the relationship between Damascus and Hezbollah. Whereas Hafez Assad maintained a measure of distance from Hezbollah's leadership, Bashar has sought a more intimate connection with the terrorist group and its sponsor, Iran. To that end, Syria increased its support of Hezbollah in several spheres, providing direct military support to the militia, complementing the massive support it already received from Iran. The weapons poured in. In the years leading up to the 2006 summer war, Syria provided Hezbollah with 200-millimeter rockets with 175-pound warheads and a range of almost 44 miles, and 302-millimeter rockets with 220-pound warheads with a potential range of about 62 miles. In addition, Syria gave Hezbollah advanced anti-tank rockets and missiles and, quite probably, anti-aircraft missiles as well. According to some estimates, 80 percent of the 4,000 rockets fired at Israeli targets by Hezbollah during the 2006 conflict came from Syria. Despite international guarantees made to Israel in the wake of the summer war, the quantity and sophistication of the weapons systems provided to Hezbollah grew rapidly. Conventional wisdom was that another conflict between Hezbollah and Israel was simply a matter of time. Thus, with the raging civil war in Syria continuing beyond its second year with no end in sight, Israel exists in an ever-more-hostile and chaotic region, with the war next door increasing and necessitating Israel's room to maneuver. For more than a decade, Israel watched as massive arms shipments passed from Iran and Syria to the Shiite organization in Lebanon, with the pace and lethality of those weapons dramatically increasing. Reports surfaced that Syria was transferring to Hezbollah Syrian-made M-600 missiles — a Syrian variant of the Iranian Fateh-110 missile. Those missiles put Tel Aviv within range of Lebanon's launchers. Media reports also claimed that Syria transferred Scud D missiles to the Lebanese terrorist group as well, putting all of Israel at risk. Estimates of Hezbollah's arsenal, acquired overwhelmingly thanks to Syria and Iran, is thought to be between 40,000 and 60,000 rockets, far beyond the levels Hezbollah had in the summer of 2006. Israel's complaints went unheeded by the international community — and the unstated rules were that Israel could not launch a pre-emptive strike despite the mountain of evidence it had gathered. Israel's recent strikes in Syria, then, are not just about preventing the transfer of game-changing weapons — they are about changing the rules of the game in how it engages with Hezbollah and Syria. Furthermore, the strikes represent an eye toward a confrontation with Iran over its nuclear program in which Tehran may look to use Hezbollah as a tool in its arsenal. Despite analyses to the contrary, Israel has not entered the conflict on behalf of any side. Israel has not attacked regime headquarters, its airfields and tank positions in a bid to assist the Free Syrian Army. The available intelligence does not suggest that Israel has attacked chemical weapons facilities in order to remove those weapons from the equation. Whereas Israel previously avoided striking convoys of weapons in Syria for fear of direct retaliation, it now may calculate that the remnants of Mr. Assad's army are too degraded and too busy defending itself against the opposition to retaliate. Hezbollah has become deeply entrenched in the Syrian army, which is using and losing some of the organization's best fighters. It may not be in a position to drag all of Lebanon into another open war with Israel while fighting to preserve the Assad regime. Further Israeli airstrikes should not be ruled out. The international community appears to have made clear that it desires no substantial role in ending the Syrian conflict, but make no mistake: Israel cannot carry America's water in the Middle East. Only the United States can lead an effective international effort to end the Syrian conflict. In the meantime, Israel will continue to protect itself against regional threats as it works to alter the rules of engagement with its enemies.